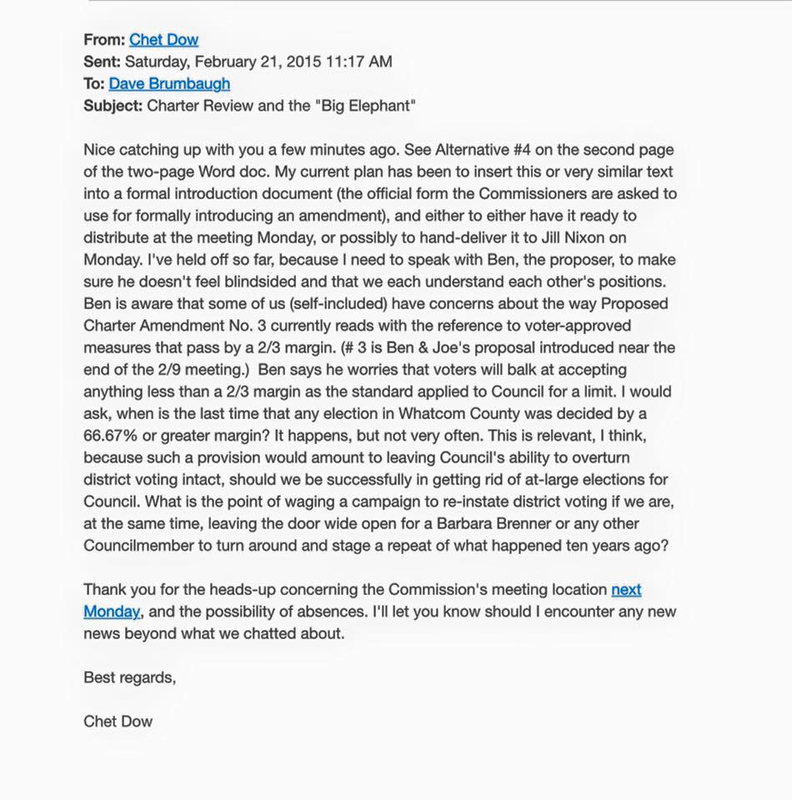 It is clear from a 2-page document (shown in 2 separate photos) attached to Charter Review Commissioner Chet Dow’s February 21, 2015 email to Dave Brumbaugh, what the goal of conservative Charter commissioners was/is. A photo of Dow’s Feb. 21 email is shown in a photo. In the 2-page document, Commissioner Dow listed 4 alternatives toward the conservative commissioners goal of tying the hands of the county council’s ability to put forth charter amendments on the ballot. The document in the email was dated February 18, so the conservative Charter commissioners were already aware of the alternate idea to require a unanimous 7-0 vote approval by county council in order to propose a Charter amendment. 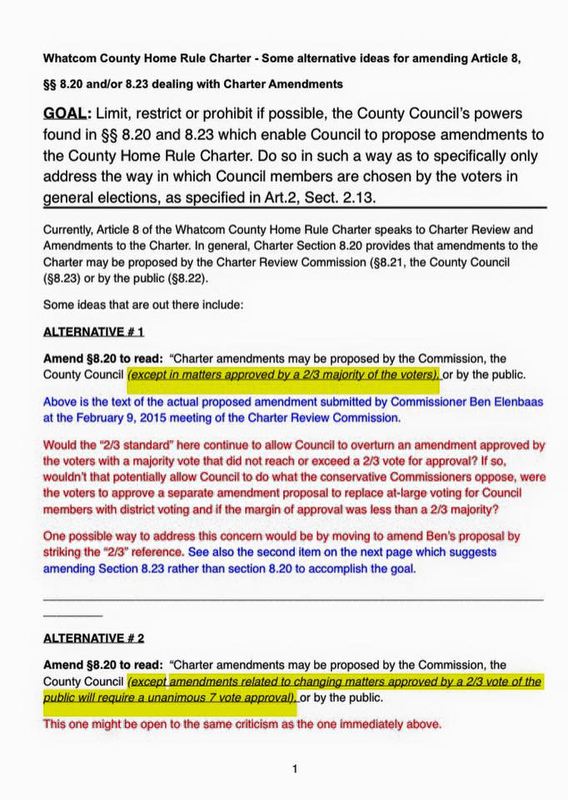 Amend §8.20 to read: “Charter amendments may be proposed by the Commission, the County Council (except amendments related to changing matters approved by a 2/3 vote of the public will require a unanimous 7 vote approval), or by the public. This one might be open to the same criticism as the oneimmediately above. So, if they already had this concept in mid-February, why did the conservative commission majority wait until the very last minute of the Charter Review process to then revise the language in amendments 3 and 10 (now called propositions 2 and 3)? Because, it is my understanding that the commission had been advised by the county attorney a number of months earlier in the Charter process, about the likelihood that amendments 3 and 10 conflicted with the WA State constitution. 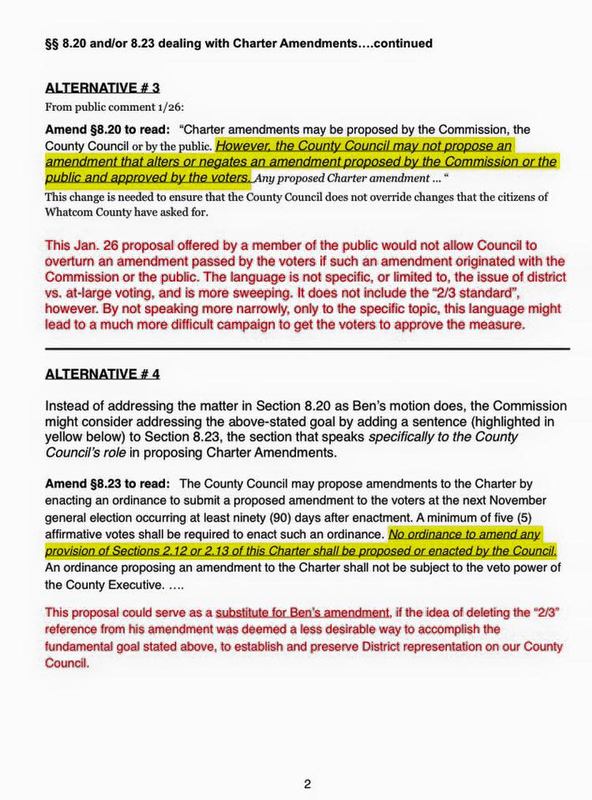 The final revised language in amendments 3 and 10 (now called propositions 2 and 3) which requires a unanimous 7-0 vote of the County council that the Charter commission passed during their July 6 special meeting, is also something that may not be legal. Read Sandy’s post on her Facebook page here. This entry was posted in Commentary, Facebook Post, Information and tagged Chet Dow, Dave Brumbaugh, Whatcom County, Whatcom County Charter Amendments, Whatcom County Council. Bookmark the permalink.